Today's post is a condensed (yes, it was even longer) form of an essay I wrote for a job/fellowship application. I have since accepted another role, so here I am reposting this to the blog. In November last year, I took up a month-long volunteer position at an NGO called Door Step School. An English teacher at the Community Learning Centre - exciting. My meticulous lesson plans crumbled when I stepped into the classroom and found myself surrounded by thirty little monsters yelling incoherent strings of rote-learned ‘missmynameispooja’, ‘hellogoodmorningbye!’ So on that first day, all I did was observe the other teachers handle the class with expertise, a healthy combination of strict and loving. Door Step School works towards bringing literacy to the marginalized sections. Some of their biggest projects include day schools for children at construction sites and the innovative School on Wheels initiative. The Community Learning Centre which I joined also had children of construction workers. They had been successfully enrolled in government schools. Now the Centre provided them with a support system to ensure they stayed in school and could manage the school-work. The counsellor at the Centre asked me to set up the base for English teaching that the next volunteer teachers could build on. My first task was to build a bond of trust. To really get through to the children, I needed to understand their contexts, the experiences that had shaped them. But all they had were questions for me! So I began to share. I told them about my house and my school, they took real delight in stories of my pet cat, and gradually, they opened up to me. I didn't realise someone was taking photos, but it did not get past the kids! We chatted about big and little things - the holiday decorations in their slum, someone’s birthday, their tiffin that day. When they shared their problems, their worries stayed with me, often long after the school hours. My first lesson hit hard, but it was also the most important - learning not to pity them. As our friendship blossomed, the issue of discipline slowly dissolved. As with all the other children I have taught, I planned my classes around the knowledge that eight-year-olds tend to be impatient and need to be constantly engaged. All the ‘English’ that these eight and nine year-olds knew was reciting the alphabet, unable even to distinguish one letter from the other or decode the individual sounds. To make it worse, they were too apprehensive to speak up. I don’t know English, they would reply in Marathi to any question I posed, until I had an idea. I drew a picture on the board. Cake! Car, scooter, table, chair, computer, the words came tumbling out. I visited the government school for a storytelling activity. Sitting in that ramshackle excuse for a classroom, with a group of bright twinkly-eyed children enthusiastically talking about their school, I realized with a new light how shameful and infuriating it was to rob them of the opportunity to learn. I decided to scrap my plan for the session and ask them what they wanted. That day we learned some twenty English words they were curious to know. Equipped with a set of phonics books, I arrived in class one day and taught them how to write their names. Sound out words from colourful storybooks. Suddenly, spelling stopped being gibberish. Car became c-a-r and different from c-a-t. I made little paper chits with capital and small letters and made them match pairs. Some games worked, others did not. With time, I developed an intuitive sense of which activities would be successful with whom. A month sounds too little in the big picture, but I am glad I powered through. I believe I made a difference. By the end of my volunteership, more than anything, I sparked in the children an interest in reading. And there was another outcome. I emerged from the experience ready to face and adapt to newer challenges. Today, I want to teach and learn from it, and do this forever. In the last post, I mentioned a project. That is what has been killing my creativity for the past three months. The topic is metaphorical language; how it is stored and processed in the mind. Now, I don't know if I am built for research, have a research bent-of-mind. I don't know, for instance, how flattering it is that I got the idea for my first serious linguistics project from a science fiction novel (Embassytown by China Mieville, if it matters.) But over the past several weeks, I have managed to stumble and bumble along, and in this big jumble of data collection and experimental software and statistical tools, I have (almost) developed a taste for it. Metaphors We Live By by George Lakoff and Mark Johnson is the first book I read post topic-selection. It is a book that is (un)popular for its intricate claims. I love it! The essence of the book is the claim that metaphors are the vessel for meaning. Linguistic experience is rooted in conceptual metaphors. We generally associate the word 'metaphor' with the literary device. Aristotle said something about a perfectly constructed metaphor being the awesomest thing ever (it's been long since I quoted Aristotle, my memory is a bit rusty.) 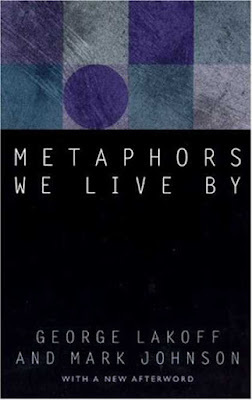 According to Lakoff and Johnson, we need to stop thinking of metaphors as some sort of flourish that poets add to their language and realize that it is something we all employ. It would be impossible to speak about 'concepts' without metaphors, that is, without likening them to concrete perceptual and physical processes. To explain what they mean, the first example they provide is that of the metaphor of ARGUMENT as WAR. His criticisms were right on target. I demolished his argument. I have never won an argument with him. We cannot talk about arguments, without talking about war. The experience of ARGUMENT finds embodiment in the language of WAR. As someone who is entirely inept at arguments, always takes them as personal attacks and surrenders in every argument with a 'Fine, I'm wrong. You win,' I can personally attest to this metaphor. But that is not the end of their line of thought. What if instead of talking about ARGUMENT in terms of WAR, we adopted the language of DANCE? Imagine a culture where two partners are said to perform an argument, where claims are choreographed to aesthetically please, where strategies are twirls. Will the resulting act of communication be an argument at all? Not as we view it, at any rate. When the words change, they conclude, so does the experience, and with that, the very action changes. The point here is that not only our conception of an argument but the way we carry it out is grounded in our knowledge and experience of physical combat. Even if you have never fought a fistfight in you life, much less a war, but have been arguing from the time you began to talk, you still conceive of arguments, and execute them, according to the ARGUMENT is WAR metaphor because the metaphor is built into the conceptual system of the culture in which you live. They give examples of other such metaphors, a stand out being TIME is MONEY. You can spend time, give someone your time, and so on. These are called structural metaphors, where the language is so structured that ideas are objects that can be spent, stored, buried, wasted and given. The authors stress however that these metaphors are only partially structured, so you can spend time, but there are no time banks like money banks. The metaphors of time don't hold true for all the structures and linguistic usages of money. Another interesting kind of metaphors is the orientational one. Anything that is GOOD is UP and BAD is DOWN. So your spirits rise, you are at the peak of your career, you do high-quality work, something boosts your confidence. In contrast, you fall into depravity, you are under someone's control and so on. The authors explain again that these distinctions are not randomly assigned but based on a network of physical and cultural experiences, that may vary across societies according to what is valued more and what needs to be brought into focus. They give many instances, so many instances that you are overcome with awe by the sheer power of their observation and inference-making skills. Eventually, things begin to get really complex, when you see that ARGUMENT is conceptualised as more than just WAR. There can be an ARGUMENT is a BUILDING metaphor (his claims were shaky) or an ARGUMENT is a JOURNEY (you can't retract your claim now, having come so far.) This is where the arbitrariness of such a descriptive piece of writing as this book begins to show through. All the hypotheses proposed by Lakoff and Johnson are strictly experiential and with every new page, they stray away from language science and into the realm of philosophy. This is not necessarily bad. Towards the end of the book, they talk about the meaning and subjectivity of truth. How any statement is true only relative to some understanding of it. France is hexagonal, Missouri is a parallelogram, Italy is boot-shaped. All of these are true to a little boy drawing a map in school and laughably wrong to any self-respecting professional cartographer. It is because we understand situations in terms of our conceptual system that we can understand statements using that system of concepts as being true, that is, as fitting or not fitting the situation as we understand it. Truth is therefore a function of our conceptual system. It is because many of our concepts are metaphorical in nature, and because we understand situations in terms of those concepts, that metaphors can be true or false. In Embassytown by China Mieville, the book that gave me the idea for the project, there is a race of aliens called Ariekei. The one difference between humans and the Ariekei is that the alien language has no metaphors. The Ariekei can only talk about things that are physically and perceptually concrete. Unlike humans, you see, the Ariekei cannot lie. Embassytown has many holes, but one thing it did impress upon me was the value of our ability to draw creative links between what is and could be. 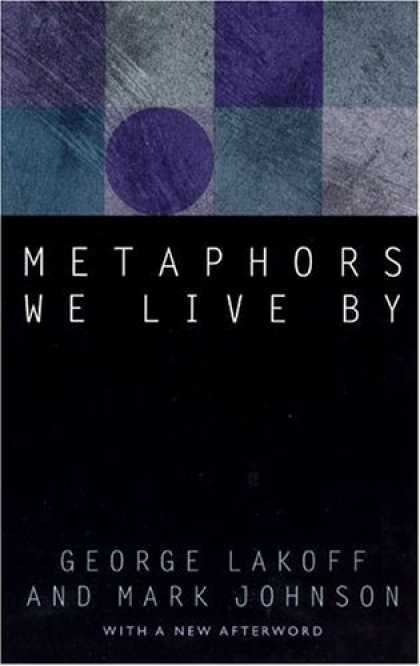 Metaphors We Live By shows the extent of this, and it is so inspired. It is a beautiful read for any speaker or learner of English. It will give you a whole new perspective on the language and a keen awareness of every word choice you make the next time you speak.